Brownouts in the Philippines, including Iloilo where we reside, are as common as cockfights. You might be in the middle of checking to see if you have any new Facebook friends on your pc, watching your favorite rerun of Darna on the Fox Filipino channel or sitting in your favorite talabahan enjoying a brew (or two) when the lights go out. It's frustrating and bothersome at times. We've had more brownouts in Iloilo compared to the number we had when we resided in mango land, Guimaras. It's something you learn to live with. Even "paradise" has it's pitfalls. Just ask Adam and Eve. The "power" company for Guimaras is GUIMELCO. I started keeping a brown out log in September 2010, almost 14 months after moving to this rural province in Western Visayas. From September 2010 through September 2011, our last full month we resided there, we experienced an estimated total of 73 brownouts. That's an average of 5.6 brownouts per month in Guimaras. Each outage in our former home lasted an average of 54.6 minutes, close to one hour each. Only one brownout in February 2011 lasting for 31 minutes. The month with the most power failures, 12, was September 2011. That month had the longest single outage of 13 hours and 52 minutes on Tuesday, September 27. Our "power" company in Iloilo for our particular subdivision is ILECO, the Iloilo Electric Cooperative. We've already had a total of 44 brownouts in Iloilo since moving here in late October 2011. Each outage averages 124 minutes in length or almost twice as long as the brownouts in Guimaras. Already nine brownouts this month as of June 20 plus two major outages in early 2012 lasting around 12 hours each. The SPC Island Power Corp., formerly Salcon Power Corp., has agreed to supply electricity to the Iloilo Electric Coop (ILECO) 2, which is expected to end frequent brownouts that affected some 85,000 households in 14 municipalities and one city in Iloilo province. The agreement was formalized in Cebu City recently with the contract signing ceremony attended by top officials of the two power firms that include Dennis T. VIllareal, president and CEO of the SPC Power Corp., and Vicente A. Paranpan Jr., president of the ILECO 2. In line with the agreement, SPC Island Power Corp. has committed to supply a total of 25 million kilowatt hours in a span of five years to ILECO 2. It can be recalled that ILECO threatened to sue the National Power Corp. (Napocor) last year because of the latter’s failure to provide the power needed by the cooperative as specified in their service contract. The power coop carried out rotating brownouts that lasted four hours. That agreement with SPC hasn't ended our frequent brownouts, and I don't look for things to improve in the near future. In fact, the records I'm keeping show the situation worsening. At least Guimaras has a progressive plan of action with windmills being installed on the mango province to help alleviate their power shortages. In contrast, Iloilo has been opening less environmental-friendly coal plants. But that's the price you have to pay for living in paradise. My asawa didn't even had electricity back at her home place in Guimaras when she was growing up. Only pythons hanging in the back yard. I think I'd rather have the brown outs. Our experience has been that brownouts in the Philippines are not too much more often than the power outages that we experience in Springfield, IL. We live in Libmanan, Cam Sur, about two months out of each year and we have had brownouts only once or twice each time that we are in residence. We must have more reliable power than you do in Iloilo. I guess we have been lucky! Wow! Only one or two brownouts each time you’re there, Mike? You guys DO have much more reliable power than we have in Iloilo or had in Guimaras. I’m green with envy. Love the photo of the electric meters. They don’t go to any lengths to do things neatly in the Phils, do they?!! Not around here, Ice Man. But our subdivision in Iloilo is a different story. Only one or two meters on a utility pole and no mass of tangled wires attached to it. We have a few brownouts here. I am always happy to see one during the day so know there will be electricity at night. I have a small Chinese generator that I bought three years ago for 8k. It was a pretty good investment. I also have emergency lighting installed in strategic locations. I believe that the electric coops buy from the ones that produce the electric. Since it is something that has price fluctuations the coops elect to reduce usage rather than pay a higher generating price. I heard that the residents of an island in the Philippines are a bit upset about the addition of windmills. They claim that the vibration has scared all of the fish away from the area and their electric bills have doubled. I couldn’t find any stories about this. I only saw the ones claiming that the politicians involved should be considered for sainthood. We had some people trying to get a solar powered water pump to function in one of our wells. Thankfully they realized it was pretty much inperfect science and opted for a real pump. The result would have been Iloilo style water. Our brownouts are usually during the day, also, Tom. I failed to mention that in the post. At least I have power available for our air con in the bedroom at night. When we build that new house in two years we’ll have to have a good back-up plan like yours. What you said about the electric co-ops makes sense. That’s what our utility company in Iloilo must be doing. Probably was the same situation in Guimaras. Thanks for that info. I just got back from spending a month in Samar, 15 min north of Calbayog. Power there is off every saturday from 6am to 6pm like clock work. During the week, power was always going off for several seconds to 30 minutes. Philippines has what we call dirty power. They do not have constant voltage or power. This is why when you buy electrical equipment or appliance and take it out the door there is no warranty that it will last. This is why I think I have had to replace motors and appliances plus light bulbs in our house. The same last for years in state but in the Philippines your lucky if they last a yr. Power during the day when it is on will vary from 230v down to 180v and at night it will vary from 230v to 290v. I have never been able to see what the voltage spikes to when it trips off and comes back on. Here in California when they have a controlled power outage, they tell you to turn all electrical equipment and appliance off so that when power comes back on the voltage spike will not damage equipment. But in the Philippines you cannot plan for power outages. You would thank that the country with the most expensive power in the world could get their S–t to gether and supply a decent service, instead of the families who controls the companys, putting all the profits in their pockets and expecting the customers to be happy with what they get. Yes I live in the Norty part of town next to the church on the main street. My wife has put in for retirement and we are planning to go back in Jan for several months. Am sending generator over door to door to take care of saturday brown outs. I talked to people in Tacloban when there and they say that they very seldom loose power. My wife has a close friend who is from your place but hasn’t been back in years, still has sister there and property. Her and husband decided to build house in Olongapo. Yes that is our house. Took 5 yrs to build because only work in town and was building on remote control. And still spending for up keep and repairs. Cost me more then the 2 houses I have in California for their up keep. If in the neighbor hood stop by and we will have a chill one. J Anthony is right around corner and I have been trying to talk my wife into getting me signed up for home delivery like bottle water.Ha. Ha. You’ve got some valuable info, George, for folks planning to move to the Philippines or for those already living here. The voltage varies wildly in Iloilo, also. I can sit in front of my fan while working on the computer, and the fan speed will get slow down even if it’s set on a higher speed. I have my computer hooked up to a voltage regulator and power surge protector. So far, that has managed to save my computer from becoming toast after almost three years of living in the Philippines. I unplug it and our tv at night. Corruption is a big problem, I believe, as far as trying to improve the infrastructure here. That’s why I have no real hope in the situation improving. Electricity IS expensive so if you’re planning to move to the Philippines, keep that in mind. While I find living in the Philippines to be cheaper than living in the States, electricity costs don’t figure into that category. In Davao we rarely have brownouts. Maybe once or twice per year. Usually those brownouts last no longer than 30 minutes. I can’t remember the last one. Wow! That’s less brownouts than we had in Illinois, Bob! You guys must be doing something right over there. Thanks for sharing that info. I’m impressed. Windmills on Guimaras would be too cool Dave !! Please alert me if this ever happens. They’re working on them as we speak, Fearless Frank. I’ll have to check on the progress next time I get to Guimaras and do a future post on it. Take care. 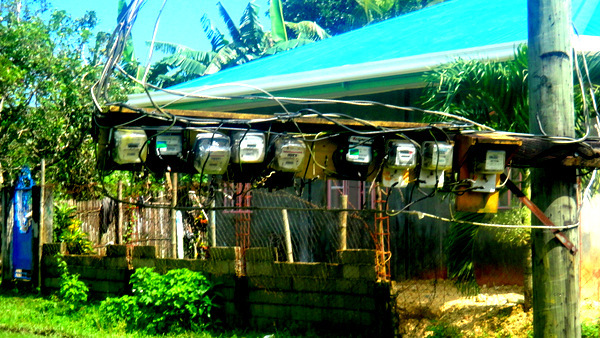 They only have electricity 6 hours a day on Santo Nino Island, from 6 PM to Midnite, when the LGU generator is running. It does make watching TV easier, lol. Six hours a day, Mark G. And I’m complaining? Guess I should be grateful for what I have. The wife is looking for an apartment in Calbayog which should help address that problem, along with the lack of running water or the lack of a real store nearby. RandyL First thing you need to do is figure out what you are going to be running off of the generator so you know what size you need. Go to web site of most brand name generators and they have a list of what watts each appliances use and it will help you decide what size you need. I bought mine from my brother in Oklahoma which is slightly used. He bought it from guy who was taking it into pawn shop. Most generators even if it has American brand name is made in China. Like most of Craftman drills are made by Ryobi and Sears just puts their names on them. So just shop around and see who has best price. Be aware that you might be charged import taxes on new items which is usually what you paid for it. You can get started at www. mccullochpower.com and I think it has list of size of generators for what you are going to be running off of it. Also for safety hire a licensed electrican to show you how to hook it up and disconnect your house from main power source during outage. I had my house wired for a generator with safetys so generator and main power cannot be on at same time. Thanks for the detailed info, George. Good tip on having having a safety installed so the generator and main can’t run at the same time. Thanks George. I’m on it! Our main concern is having enough juice to power our refrigerator/freezer and a rice cooker and fan or two. I can deal with the heat with cold SMB! I’ve noticed too that most larger generators have both 110v/240v outputs and seems like they would be more versatile for use over there. I searched high and low for a good generator. I went to Tacloban with my brother-in-law to see if we could find anything that was not Chinese made. It’s almost impossible. I finally ended up buying a 6KW diesel at a place across from Nijaga Park (We need to power 4 houses on an as needed basis). I forget what we paid, maybe P62,000? When I inquired about the warranty and the shop lady stated with a smile “It’s Chinese; what warranty?” She then offered to fix it for only the cost of labor for a period of 6 months should anything go wrong with it. That was agreeable to all. What sold me was her honesty and attitude. It’s been a couple of years now with no problems other than a new battery. Mark, you would pay close to that here in the U.S. for a 4KW. Then if you pay shipping and import taxes, you’d be better off buying it there. Like George says: there all made in China anyway! I looked high and low in Philippines for a generator set for my house looking at new and rebuilt diesel the cheapest I found for an 8 to 10kw was $ 4500.00 to $ 6500.00. I settled for a 5kw gas powered generator that I got from my brother for $300.00 and will operate 1/2 my house for 8hrs on 5 gal of gas. Just have to make sure I don’t overload it while running. I think we will use it until it wares out and can afford correct size. I found a place in Calbayog if you can catch them open that sales generators made in China and if they do not have the size you need they will order it for you. If you want to pay their price which is not cheap. I think they have Kano price and Filipino price. Also a word for the wish for people who are thinking about building their houses in small towns if you don’t want a lot of pissed off neighbors. Make sure the transformers which the power company is using will carry your house and the rest of the town. I don’t think they have up graded them since installed when people only used a light or two and fans. I informed the power company of what I would be using in my house and how many amps it would probably be pulling if everything was running and they said no problem. After my house tripped the town off several times because the transformer was not big enough they had to come back and install another transformer and wires to my house and put in a steel post which would hold both transformers . Well guess who got to pay for it and still have to rent the transformer. I checked and my house only pulls 30 amps when everything is running. It is wired like in states with 100 amp service breaker and each load breaker is no more then 20 amps. That’s some good info on the generators, George, thank you. I’ll make sure my Filipino brother-in-law scours the area when we’re ready to purchase the generator for our new place in two years. I can assure you that the “kano, skin tax” is alive and well in our area, Western Visayas. The price of those generators you looked at are not cheap. Well, collecting info and checking out all our options will help in our planning. Interesting story about the transformer problem. We had our amp service in Guimaras upgraded when we purchased our air con. Fortunately, the rental home in Iloilo is handling the air con without any problems, that is WHEN we have power. Thanks again, George for all the detailed info and your insight. We sent $200 to my father-in-law years ago, Mark G., to buy a generator for him that my asawa said he absolutely needed. Seven years later it still sits in the back of our home in Guimaras. My brother-in-law fires it up on a regular basis to make sure it still works. We didn’t want to put the money into having the wiring changed since our plan is to build our new house in Iloilo in two years. Just had another brownout last night in our subdivision, another two hour one, the tenth one this month. You can bet that the new place will have a generator ready to go. You said you will have inverter A/C for your house. Is it really energy effficient like i heard it was? Thanks so much for any info you can give me. From everything I have read and heard, the split system is the way to go. My plan is to place a small system in each of the two BR’s and a larger unit in the main living area. That way we can control each room separately in hopes of saving pesos. PapaDuck, the Ice Man has one and stated it is about 50% cheaper to run, if I remember correctly. Thats a big savings. After the initial expense, you should really save. Yep, and with electric rates continuing to rise in the Philippines, PapaDuck, sure does seem that the split-system air con is the way to go.